"There is nothing more terrifying than hearing multiple people get shot while you’re under your desk and then hear the gunman reload." That tweet was posted Thursday by Phil Davis, a reporter at the Capital Gazette in Annapolis, Maryland, right after a gunman carried out an attack at the newspaper's offices that left at least 5 dead and others injured. After Davis was evacuated to safety, he turned to Twitter to describe the scene, which he told The Baltimore Sun "was like a war zone." "Gunman shot through the glass door to the office and opened fire on multiple employees. Can’t say much more and don’t want to declare anyone dead, but it’s bad," he said in one tweet. While Davis laid out the tense and terrifying event in detail, it may have been an intern who first posted about the shooting. Anthony Messenger, who is believed to be an intern with the paper, posted a chilling tweet at 2:43 p.m.
"Active shooter 888 Bestgate please help us." The newspaper’s offices are located at 888 Bestgate Road in Anne Arundel County. Then came a series of tweets from Davis, the newspaper’s courts and crime reporter, who wrote as he was waiting to be interviewed by police. "A single shooter shot multiple people at my office, some of whom are dead," Davis wrote. Late Thursday, officials released the names of the deceased victims: Wendi Winters, Rebecca Smith, Robert Hiaasen, Gerald Fischman and John McNamara. The suspected gunman, 38-year-old Jarrod Ramos, was unharmed and taken into police custody. Meanwhile, an article at the top of the newspaper’s website, written by a reporter from its owner, The Baltimore Sun, reported the news. 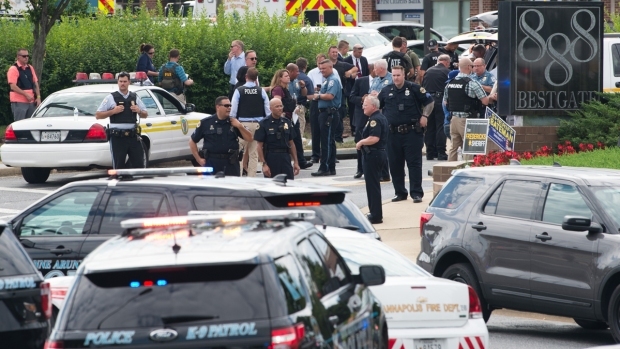 “Five dead, others 'gravely injured' in shooting at Capital Gazette newspaper in Annapolis,” read the headline at capitalgazette.com at 5 p.m. Thursday. 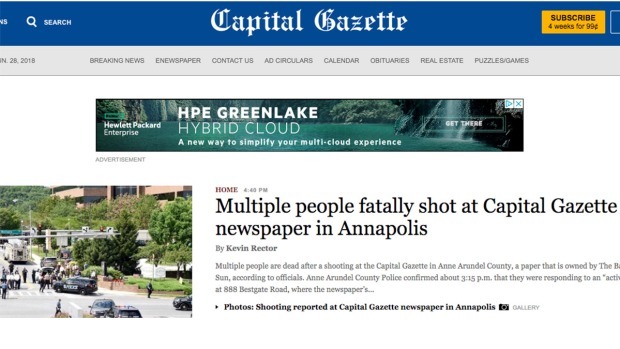 The homepage of the Capital-Gazette leads with a story about a gunman who stormed their newsroom and killed 5 people earlier that same day, in Annapolis, Md., June 28, 2018. Within hours of the deadly shooting, journalists at the Capital Gazette were back to work, covering the terror and tragedy that had just unfolded around them and hustling to get Friday's edition to print. Reporter Chase Cook tweeted: "I can tell you this: We are putting out a damn paper tomorrow." The paper's Twitter account later shared an image of their front page and the editorial page, which was left mostly empty in honor of the victims.